Tuesday November 29th 1921 Two weeks today since I left home. We slept late. Nellie and I went down town with his neighbor in his car. Had lunch and went to see "The Queen of Sheba." Came home before night I wrote to Lydia and The Reed girls. Harry called again tonight. Wednesday November 30th 1921 I wrote Ida, Mr Able, and to Iowa City about the paper. We went down town for lunch and went to Vaudeville to see "Elsie Janis & her Gang." Very good. It was dark when we came out on the street. Irene had supper ready. a misty day. 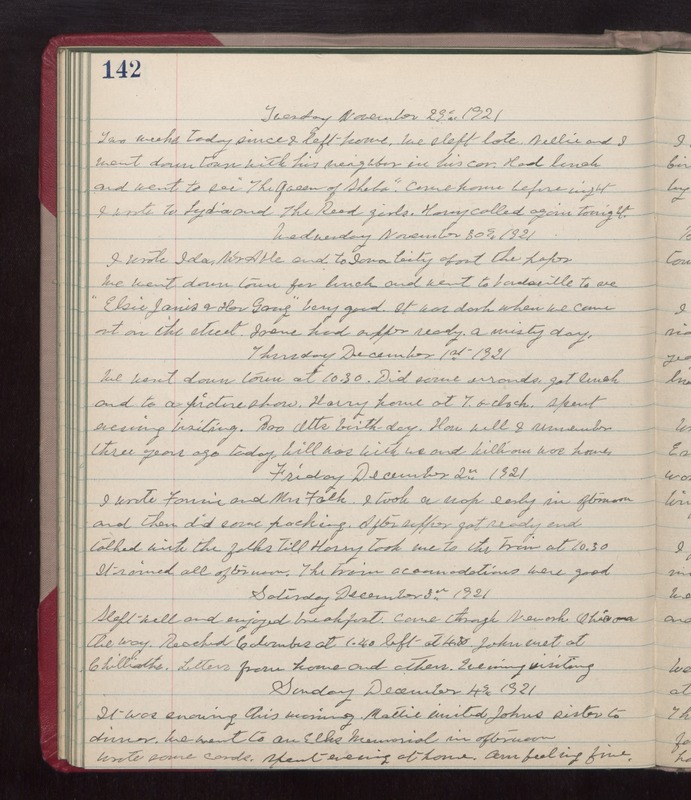 Thursday December 1st 1921 We went down town at 10.30. Did some errands. got lunch and to a picture show. Harry home at 7 oclock. Spent evening visiting. Bro Otts birthday. How well I remember three years ago today. Will was with us and William was home. Friday December 2nd 1921 I wrote Fannie and Mrs Falk. I took a nap early in afternoon and then did some packing. After supper got ready and talked with the folks till Harry took me to the train at 10.30. It rained all afternoon. The train accommodations were good. Saturday December 3rd 1921 Slept well and enjoyed breakfast. Came through Newark Ohio on the way. Reached Columbus at 1.40. Left at 4.30. John met at Chillicothe. Letters from home and others. Evening visiting. Sunday December 4th 1921 It was snowing this morning. Mattie invited Johns sister to dinner. We went to an Elks Memorial in afternoon. Wrote some cards. Spent evening at home. Am feeling fine.